Those Parts Should Be Waterjet Cut | KLH Industries Inc.
At their most basic interpretation, waterjet cutting and laser cutting do the same thing - they cut stuff. One with water, the other with heat. Each uses a naturally occurring process, greatly intensified and harnessed, to maintain tight tolerances. Choosing between the two processes largely depends on the size of the work piece, the type of material, and the desired application. The height of the material may be the easiest way to exclude one process. Laser cutting has difficultly piercing above 1". At KLH, waterjet cutting can conformably precision cut 4-6", but can also blank or rough cut upwards of 12-22". Heat-affected zones are the results of metal being melted during the cutting process. These zones develop micro-cracks and harden the material. Waterjet cutting has been described as the most versatile cutting process in the world. Waterjet manager at KLH Industries, Tim Henning, admits he's "yet to find a material he can't cut. Everything from rubber, foam, and cork, to Hastelloy ®, Inconel ®, and military-grade composites. Titanium even shoots sparks, but it cuts no problem." Lasers struggle to efficiently cut materials with high thermal conductivity, such as aluminum, which disperses the energy from the cutting beam laterally. Most other alloys can be cut using either process. Even still, just because lasers can be used to cut metal, doesn't mean it necessarily should be used. Heat-affected zones are the result of metal being melted during the cutting process. These zones develop micro-cracks and harden the material. As the name suggests, waterjet cutting does not produce a heat-affected zone. According to Flow International, a manufacturer of Waterjets, structural components in the aerospace industry, which are "subject to large loads could experience catastrophic failure under a load stress." The heat-affected zone sustains a change in its microstructure, further limiting the downstream applications for laser cutting. The hardened heat-affected zone can also create excessive wear on downstream CNC machining operations. Additionally, large, difficult to machine materials can be blanked using a waterjet for a fraction of the price and time of CNC milling. 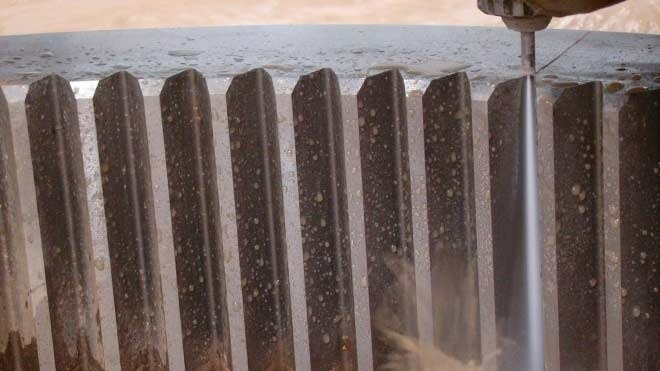 A notable disadvantage to waterjet cutting is typical water consumption. Some straight-from-the-factory waterjets will use thousands of gallons of water in an 8-hour run time. KLH reduced waste by installing a water reclamation system, reducing consumption by more than 95%. The only water lost in this closed-loop system is due to evaporation. At their most basic interpretation, both waterjets and lasers will do the same thing - cut. Dig a little deeper to find which one is truly best suited for your application. Contact Waterjet Manager Tim Henning, you might just hear, "Those parts should be waterjet cut."